"Most of my team are women and we all try on each and every design. We all have different tastes, body shapes and styles. If a dress doesn't please all of us, I tear up the pattern." And luckily for us, this has translated into several Muslimah-friendly oufit ideas. 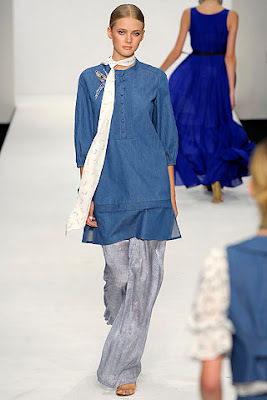 Loose layers comprising of blazers, tunics and wide leg trousers, and floaty maxi dresses were some of the looks featured in the Issa Spring 2009 collection. Helayel spiced up cool shades of blue with statement jewellery including earrings, brooches and necklaces. I for one love the chic simplicity of the first two looks here. Which is your favourite? Salam I love the last dress the colours great but i dont really wear blue for some reson! going to look on the web! 1st two r gr8..specially the 2nd one. I am loving the tunics. There has been a trend of wearing the tunics with skinny jeans or leggings, but wearing them with loose trousers can be just as nice or even more nicer......It looks very modest and classy this way. Rly nice! I'm not sure if my post is stuck in moderation or whether I forget to press send so am sending it again, I hope you don't mind. I love the clothes, especially the blue tunic but was really sad when I saw the price tags - so far out of my range as to be laughable. Theresa, and anyone else who loved the blue tunic, Uniqlo are selling an almost identical one for just £14.99! that's great jana - JK!